- Vol. 1, no. 1 (Oct. 27, 1942)-v. 12, no. 9 (Aug. 31, 1945). - Saturday issue has title: Topaz Saturday times, Dec. 5, 1942-Jan. 23, 1943; Saturday Topaz times, Jan. 30-Feb. 27, 1943. - Editor: E. Kirimura, ; T. Katayama, Jan. 30-Apr. 6, 1943. - Vol. 1, no. 1 preceded by 10 introductory issues published Sept. 17-Oct. 24, 1942 and called pre-issues no. 1-10. - Internment camp newspaper. Cf. Hady, M.E. and J.P. Danky. Asian-Amer. periodicals and newspapers. - Published at the Central Utah WRA Relocation Center established by the War Relocation Authority. Topaz Times . (Topaz, UT), Aug. 15 1945. https://0-www.loc.gov.oasys.lib.oxy.edu/item/sn85040302/1945-08-15/ed-1/. 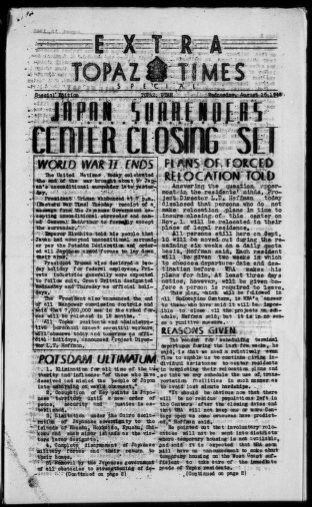 (1945, August 15) Topaz Times . Retrieved from the Library of Congress, https://0-www.loc.gov.oasys.lib.oxy.edu/item/sn85040302/1945-08-15/ed-1/. Topaz Times . (Topaz, UT) 15 Aug. 1945. Retrieved from the Library of Congress, www.loc.gov/item/sn85040302/1945-08-15/ed-1/. Public Law 109-441: preservation of Japanese American confinement sites.